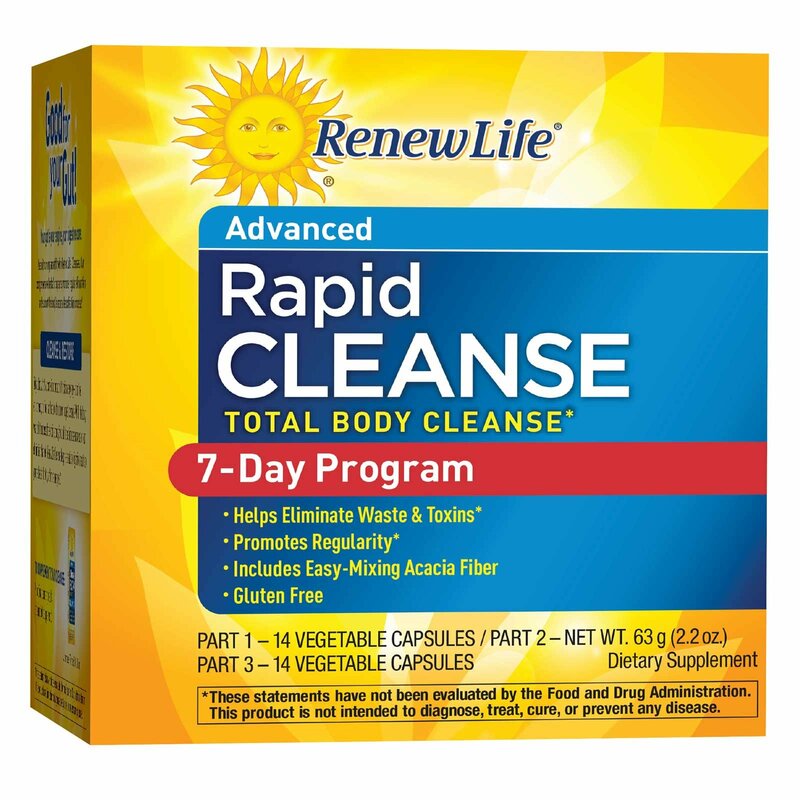 Renew Life Advanced Cleansing Programs are powerfully formulated to help you get rid of digestive toxins and restore regularity. They provide targeted support to the body's pathways of elimination: liver, lungs, lymphatic system, kidneys, skin, blood, and bowel. 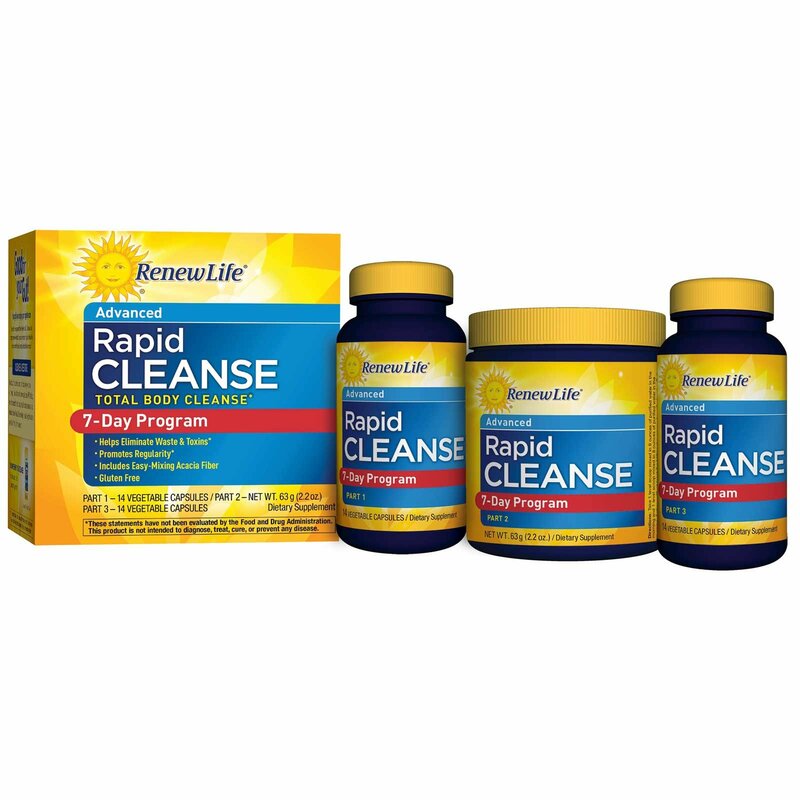 Rapid Cleanse is an advanced, three-part cleansing program ideal for those who experience occasional constipation and want a fast, one-week program. Part 1 supports detoxification; Part 2 helps with the removal of digestive toxins; Part 3 promotes healthy bowel elimination. Directions: Take 2 capsules in the morning on an empty stomach. Wait 30 minutes and take part 2. Follow this regimen day 1 through day 7 of this program. Directions: Take 1 level scoop mixed in 8 ounces of purified water in the morning and 1 level scoop mixed in 8 ounces of purified water in the evening. Follow with at least 8 additional ounces of purified water. Follow this regimen day 1 through day 7 of this program. May decrease to one scoop a day if elimination is sluggish. Drink plenty of water while using this product. Directions: Take 2 capsules at night with 8 ounces of purified water. Follow this regimen day 1 through day 7 of this program. Acacia is a legume and is in the same family as the peanut. If you have a peanut sensitivity, please consult your healthcare professional before using. Do not use this product if you are pregnant or nursing. Consult your healthcare professional before using this or any product if you are trying to conceive, taking medication, or have a medical condition. Not for prolonged use. Do not exceed recommended amount. 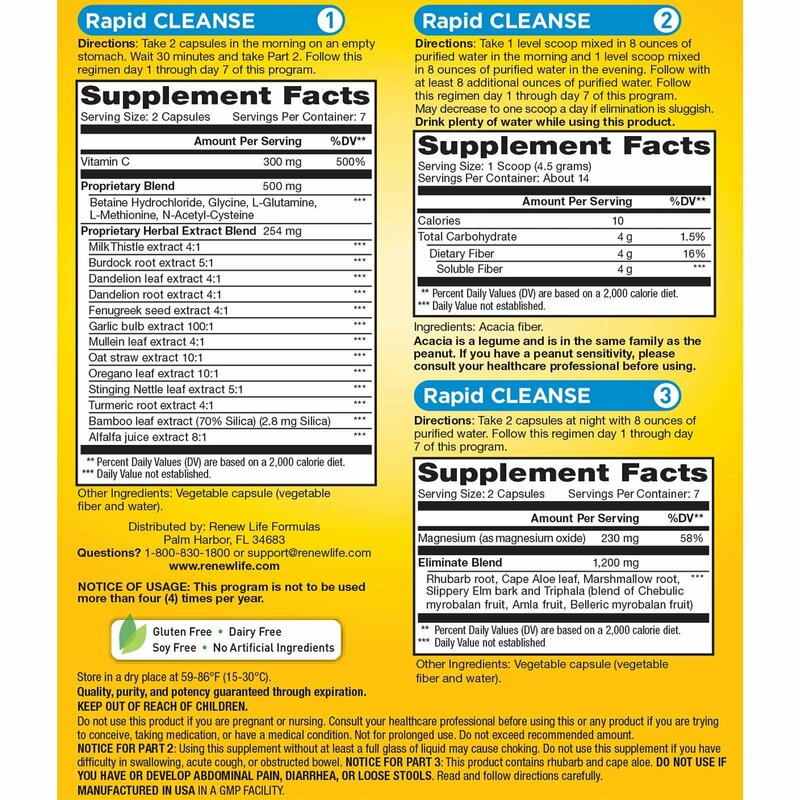 Notice for Part 2: Using this supplement without at least a full glass of liquid may cause choking. Do not use this supplement if you have difficulty in swallowing, acute cough, or obstructed bowel. Notice for Part 3: This product contains rhubarb and cape aloe. Do not use if you have or develop abdominal pain, diarrhea, or loose stools. Read and follow directions carefully.